The No. 21 Thunderbirds have made a habit out of breaking the school record this season, and did it again on Friday night by scoring a 197.025 and topping the Wolfpack of North Carolina State who scored a 191.625. “That was amazing, I’m so proud of the girls,” SUU head coach Scott Bauman said. Friday night was also senior night, with seven different Thunderbirds bidding farewell to the Centrum Arena, and it was made even more special by the Thunderbirds finally getting over the 197.000 barrier. “I’ve waited 26 years to go 197.000, that was one of the coolest feelings ever,” Bauman added. The Thunderbirds also competed in front of 3,964 fans, setting the highest average attendance on record in school history. The season average was 3,222. The Thunderbirds have broken the school record on three different occasions this season. The first time being at home against Denver, and then again that same week against Utah State. This group of Flippin’ Birds now owns the top four scores in school history. Senior Flippin’ Bird Stacie Webb said the team was so excited to finally break through that barrier, and the sky's the limit now. Senior Tyly Bozzuto set a new career-high on vault, leading the Thunderbirds with a 9.900. The score was enough for an event championship as well. Megan McBride and Stacie Webb set the second highest marks for the Thunderbirds, scoring 9.850s. The Flippin’ Birds scored a trio of 9.875s on bars, as Amber Heltemes, Madison McBride and Kirsten Yee all hit that mark. They all shared the event title. As a team the Thunderbirds tied the school record on bars, hitting a 49.300. On beam, Webb and Kamryn Bayer set the top scores, both hitting a 9.875. The duo shared the event title. Bozzuto and Autumn Jorgensen were not too far behind, scoring a 9.850. The Thunderbirds capped the night with a memorable floor performance, receiving three 9.900s from the judges. Madyson Blake-Howard, Jorgensen and Bozzuto all hit the mark. For Bozzuto it was a new personal best, making it two top marks she set on Friday night. They all shared the event championship. 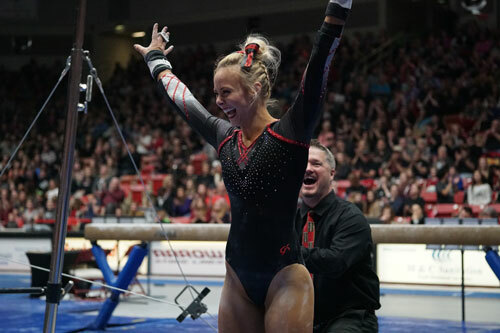 Bozzuto said that knowing it was her farewell performance in the Centrum really pushed her to do something special on Friday night. “Just knowing that this is the last time with them in this arena with our crowd and our families, it was really emotional and it made it a really fun meet,” Bozzuto said. Even though the Thunderbirds are done at home, their regular season is not done yet. SUU will head out on the road to face off against Utah State on March 10th. For all things SUU Gymnastics follow @suugymnastics on Twitter and Instagram and like the SUU Gymnastics page on Facebook.